WS-BPEL（Web Service Business Process Execution Language）, standarlized by OASIS, is a language that define the inteaction of business process by multiple Web servicces．WS-BPEL can realize business process for Web service composition, based on Web service standards like SOAP and WSDL. Process described by WS-BPEL（BPEL process） is defined as collection of Web services based on some decided sequences. The Web services used in the BPEL process is handled as a black box. BPEL process itself can be opened as Web service. The purpose of this exercise is to learn and practice how to describe BPEL process for Web service composition by using WS-BPEL design tools (e.g., Eclipse BPEL Designer). In this exercise, you are required to realize the composite back translation service (translate the source from language A to language B and then traslate the result from language B back to language A) by connecting two atomic machine translation services provided by the Language Grid. The back translation is always used for evaluation of the machine translation quality. BPEL process is described in XML. We will show the XML structure example of back translation example as follows. Tasks in BPEL process is described as activities. Different types of activities have different functions. Here we explain some activities that will be used in this exercise. Process Definition: In this step, BPEL process is described. The invoke of Web services and the execution sequences are desribed. BPEL process is described in XML, however, it can be visualized by using GUI editor for BPEL process（e.g., Eclipse BPEL Designer(open source), ActiveVOS Designer (business license) and so on）. Process Deployment: In this step, BPEL process is deployed in BPEL execution engine so as to be opened as executable service. The steps of BPEL process deployment are different for different execution engines. Test: In this step, the deployed BPEL service is tested for execution. In this exercise, we will create BPEL process using the following environment. To describe BPEL process for Web service composition, we use visualized BPEL editor. In this exercise, the opensource software Eclipse BPEL Designer will be used. Eclipse BPEL Designer is opened as the Eclipse plugin. Therefore, it is required to download Eclipse3.4 (Ganymede) and install it. Eclipse BPEL Designer does not properly work on Eclipse 3.5. After installing Eclipse 3.4, refer to the following page to continue to install the BPEL Designer plugin. We use the opensource software ActiveBPEL Community Edition BPEL Engine as the BPEL execution engine. To use ActiveBPEL Community Edition BPEL Engine, JDK5.0 is required. Download it from the following page and install it. NOTE: The version of JDK must be 5.0. ActiveBPEL Community Edition BPEL Engine does not correctly work with JDK 6. After installing the JDK, it is required to set the environment variables as follows. After installing Tomcat, it is required to set the environment variable as follows. Download the ActiveBPEL Community Edition BPEL Engine（version 5.0）from the following link. As for the installation method of ActiveBPEL Engine, refer to "doc\install_engine.txt" after extracting the downloaded file. If the installation is correct, access the following URL when Tomcat is running, and the administration page of ActiveBPEL Engine can be displayed. In this exercise, you are required to realize the composite back translation service (translate the source from language A to language B and then traslate the result from language B back to language A) by connecting two atomic machine translation services provided by the Language Grid. The machine translation service used in this exercise is J-Server (Kodensha) provided by the Language Grid. The specification of the back translation BPEL process is as follows. 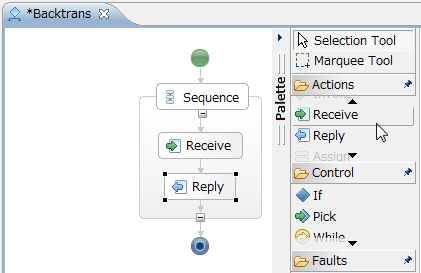 The dataflow in this BPEL process is shown as follows. 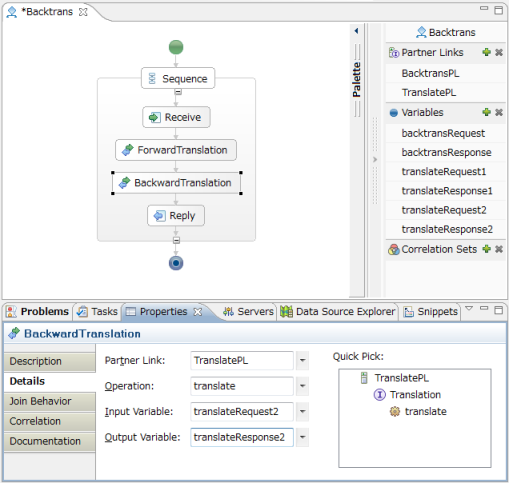 Steps for creating back translation BPLE process using Eclipse BPEL Designer is as follows. Start Eclipse, select File->New->Project from the menu and select BPEL 2.0->BPEL Project. Set the items as follows. Right click the created Backtrans project, and select New->Other, BPEL2.0->New BPEL Process File. Set the items as follows. As shown in the following figure, in the back translation BPEL process the Receive activity (receive message from client) and the Reply activity (reply message to client) are required. To add the Receive activity and the Reply activity, please follow the steps below. Click the Palette bar on the right side of the BPEL process editor window, the list of activities will be shown. Drag "Receive" and "Reply" into the "Sequence" structure. Right click "Receive", select "Show in Properties", and click the "Details" tag. 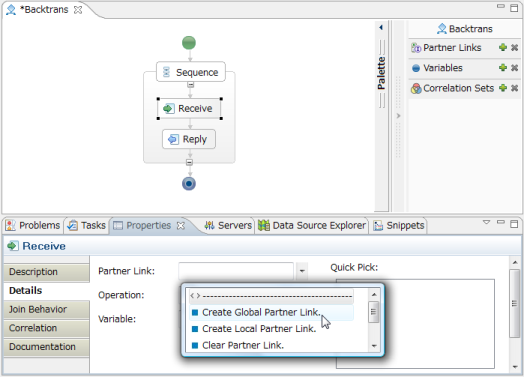 In "Partner Link", select "Create Global Partner Link". Set the name of Partner Link as BacktransPL. In the "Choose Partner Link Type" dialogue, select Backtrans from the column of Matches, and click OK. If the Backtrans is not shown, select the radiobutton of "Show Partner Link Types" column, and select "From Project" to confirm. Set the items in the following two dialogue as shown below. 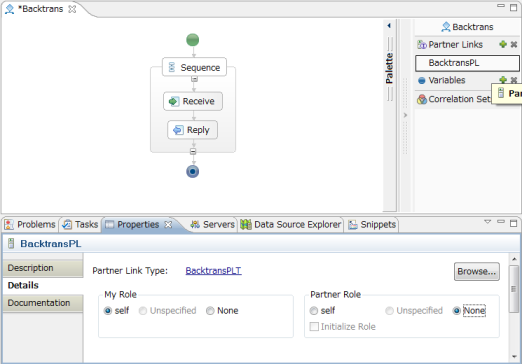 Select BackTransPL from PartnerLinks on the right top of the window, set "My Role" as "self". Save the BPEL process in this phase. Select File->Save from the menu, or use Ctrl+S to save. In "Properties" of "Receive", set "operation" as "translate". Then, the input variables will be created. Click "+" in the "Variables" tag on the right side, and change the created variable name as backtransRequest in the "Description" tag on the buttom part of the window. When the backtransRequest is selected, click "Data TypeからBrowse..." in the "Details" tag within the "Properties" tag and select "translateRequest"（Please confirm that "From Project" is selected in "Show XSD Types". Also confirm that "Messages" is checked in "Filter". Moreover, "Show Dupilicates" should also be checked. Select the one that has "intermediateLang"）．If the "Details" tag is not shown, right click "backtransRequest" and select "Show in properties". Finally，set Properties->Details of Receive as follows. Check "Create a new process instance if one does not already exist"
The input variables will be created. Click "+" in the "Variables" tag on the right side, and change the created variable name as backtransResponse in the "Description" tag on the buttom part of the window. Set Properties->Details of Reply as follows. 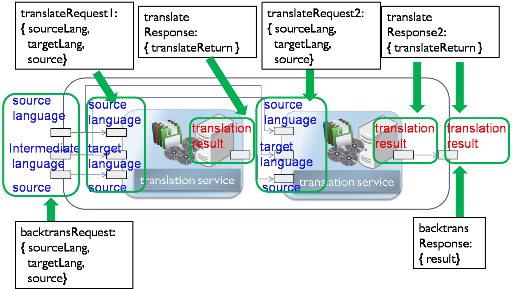 As shown in the following figure, in the back translation BPEL process, it is required to add the invoke activity twice for calling external translation service J-Server twice. Add "Invoke" by following the steps shown below. Drag "Invole" from "Palette", and place it between Receive and Reply. Set Name as ForwardTranslation by selecting "Properties" tag->"Description" tag. Select "Create Global Partner Link" in "Partner Link" by selecting "Properties" tag->"Description" tag，and set Partner Link Name as TranslatePL. In "Choose Partner Link" dialogue, select Translation from the column of Matches, and click OK. If the Translation is not shown, select the radiobutton of "Show Partner Links" column, and select "From Project" to confirm. 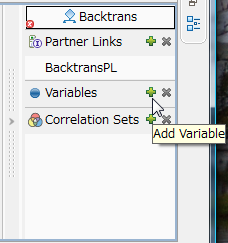 Select BackTransPL from PartnerLinks on the right top of the window, set "Partner Role" as "translator". Then, the input variables will be created. Click "+" in the "Variables" tag on the right side, and change the created variable name as translateRequest1 in the "Description" tag on the buttom part of the window. Select ForwardTranslation, set items from Properties->Details as follows. Right click ForwardTranslation and select Duplicate, set the name as BackwardTranslation from Property->Descriptions. Line the sequence of the two invoke activities as ForwardTranslation -> BackwardTranslation. Same as ForwardTranslation, create and set two variables "translateRequest2" and "translateResponse2". Also set the "Data Type" the same as that of ForwardTranslation. To transfer the execution result of one Web service to the other, it is required to difine the Assign activity for operating the variables. In the back translation BPEL process, the following three Assign activities are required. The following figure shows all the dataflow of the three Assign activities. Add "Assign" by following the steps below. 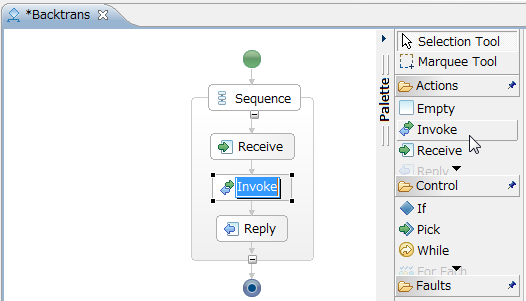 Drag "Assign" from "Palette", and place after the Receive activity. Set the "Assign" activity. Create the following three copy operations by add "New" in "Properties"->"Details"
Same as above, create the second Assign activity between ForwardTranslation and BackwardTranslation. Set the copy operations of the Assign activity as follows. Create the third Assign activity after BackwardTranslation. 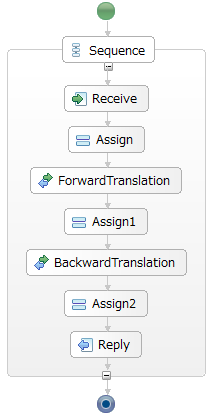 The following figure shows the screenshot after the whole back translation BPEL process is created. To execute the BPEL process in the ActiveBPEL engine, it is require to deploy BPEL process. 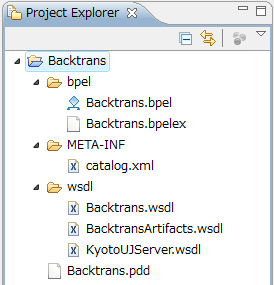 Therefore, two files for describing the deployment information are required (Backtrans.pdd and catalog.xml). Download "Backtrans.pdd" from here. In the tags of "abp:User" and "abp:CleartextPassword" (the part of "******"), set the temporary ID and password (or the Language Grid user ID and password). For the details of how to describe the pdd file, please refer to the ActiveBPEL documents. Rearrange the directory of the BPEL project as follows. Create three folders as bpel, wsdl and META-INF, and move the files. With rearranging the directory, bpel file is required to be modified. Open the bpel file by text editor, and modify the "location" property of "import" tag（three places） from "Backtrans.wsdl" to "../wsdl/Backtrans.wsdl". Open the command prompt, move the current directory to the BPEL project directory, and execute the following commands. If there are errors, confirm whether the environment variables JAVA_HOME and CATALINA_HOME are correctly set. After executing above commands, it might take at most one minite to deploy the BPEL process in the execution engine. In the installed directory of Tomcat, start Tomcat by executing "bin/startup.bat", or starting "tomcat5w.exe" and selecting "Start" from the "General" tag. Tomcat can be stopped by executing "bin/shutdown.bat", or starting "tomcat5w.exe" and selecting "Stop" from the "General" tag. When proxy is required for connecting the network, modify "bin/catalina.bat" (or "catalina.sh") by adding "-Dhttp.proxyHost=YourProxy -Dhttp.proxyPort=YourProxyPort -Dhttp.nonProxyHosts=localhost" behind "set JAVA_OPTS= …", or starting "tomcat5w.exe" and set "Java Options" from the "Java" tag by the same method. When Tomcat is running, access http://localhost:8080/BpelAdmin and the ActiveBPEL engine administration page will be shown. 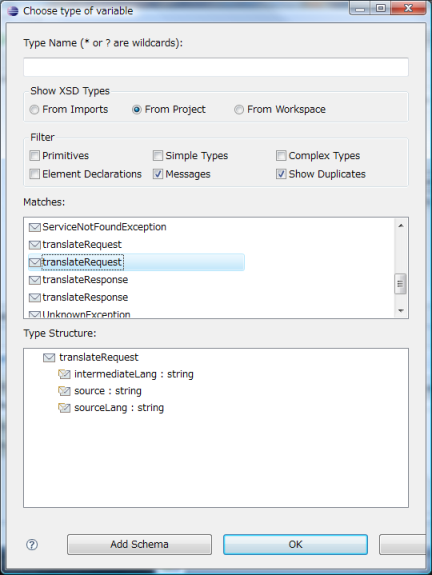 Select "Deployed Service" from the left menu, click Backtrans, and the WSDL will be shown. Use soapUI to test the service by the same method in the former exercises. 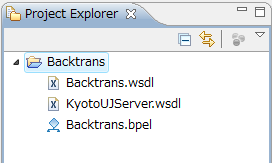 In soapUI, there might be multiple Bindings, select BacktransBinding. You can practice this exercise more by creating back transtion service using more than two intermediate languages at the same time. To achieve this extended exercise, you can use the following language service provided by participants of the Language Grid together with J-Server.